Nathalia is resilient, spirited and humorous, but it’s her heart that her mom, Katy, loves most. Full of gratitude, Nathalia never misses a chance to thank the nurses, doctors and other caregivers who’ve helped her through her treatment for osteosarcoma, a devastating bone cancer. Before she was diagnosed, she had been limping and complaining of leg pain for about six months. During that time, Katy brought her daughter to the doctor, but they were told she most likely had a torn ligament or simply growing pains. Later that same afternoon Nathalia received devastating news…she had cancer. Starting in her leg, the disease had already spread to her lungs. A whirlwind of scans later, she had a treatment plan: 5 cycles of intense chemotherapy and a surgery on her leg, which thankfully, would not have to be amputated. After chemotherapy, doctors would then do surgery on both her lungs to remove smaller tumors. In the middle of her treatment, her body stopped responding to the original treatment plan, so they had to pivot and try an entirely new chemotherapy cocktail. Unfortunately, this meant more time in hospital for Nathalia. At first, the new treatment option was very effective, and surgeons were able to move forward with surgery as planned with good results. But, it stopped working again. Despite failing chemotherapy treatment, doctors went ahead and performed her second surgery on her lungs. From the pathology report, doctors found that two of the tumors had living cancer cells, which meant that the cancer was still very active within her body. 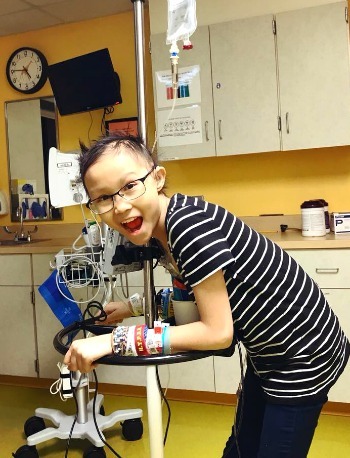 At this point, her family had to weigh Nathalia’s options: She could either go on an oral chemotherapy or she could sign up for a clinical trial which involved a shot once a month. They decided to try the clinical trial. Though the shots worked for a while, scans last fall showed that Nathalia’s cancer had returned. Since then, it has spread rapidly on her spine and in her lungs. She spent several weeks in and out of the hospital, and doctors are trying to help her control the pain. In March, she moved back to her home in Duluth where she will have hospice nurses help her mom take care of her. During one of her hospital visits, Nathalia realized the reality that she could pass away. She told her mom that “if she passed, that she hoped that in some way, she would still be able to help raise awareness and help others who were in the same situation she was in,” Katy said. Although the return of cancer was devastating, Nathalia and her family have hope for the difference they can make. Nat dedicated herself to helping others, even one of the most difficult times of her life. She asked for donations of art supplies to hospitals around the country, and she courageously continues to share her story of strength with others.